New World ovens offer a great range of integrated and freestanding cookers. Available in classic stainless steel, cutting edge contemporary and traditional range designs, whether you’re looking for sleek lines or vintage curves you’ll find a New World oven that’s perfect for your home. Gas or electric, built-in or freestanding, New World’s latest oven range is packed with useful features to make your cooking and baking easy. 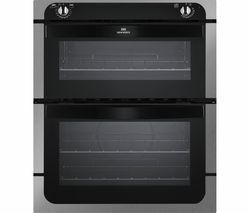 Choose from single or double ovens for increased capacity, and make the most of the brand’s clever Gyrofan technology. The fan-assisted system ensures that the heating element distributes hot air evenly throughout the oven, giving you more precise temperatures and rapid cooking speeds, which is especially great for baking. The grill can be combined with the Gyrofan to brown and crisp your food whilst retaining its succulent character – excellent for creating a rotisserie effect. The multi-purpose fan can also be used for effective defrosting, gently thawing delicate items. Simple electronic programmers make it easy to control your oven cookery, while easy-clean enamel interiors make light work of any baked on food or grease, which is simple to wipe away. Designed for energy efficiency, New World ovens are rated as Class A performers, making them both highly eco-friendly and economical. Clear viewing windows and interior lights make it easy to check progress without having to open the door and waste heat, while the door’s heat-reflective glass ensures optimum heat retention. For the ultimate in flexible cooking, our New World oven range is available in a variety of colour surrounds and finishes to complement your kitchen and the rest of our appliance range, including our hobs, hoods, fridges and microwaves.